There are a few images that are indelibly associated with the British monarchy and with Queen Elizabeth herself: the famous royal crowns, the guards at Buckingham Palace, the queen's seemingly inexhaustible supply of handbags, and, of course, her corgis. 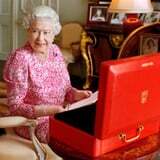 Another image that is deeply associated with the monarchy is the famous "red box," a briefcase-style box covered in red leather that is used to convey daily dispatches from the government to the monarch. Like many elements of the monarchy, some information about the use and history of these boxes is available, though not everything. Red boxes for governmental papers are nothing new. In fact, the tradition of using wooden boxes, covered in red leather, for government dispatches dates back to the 1860s. The red boxes weren't just used to send information to the monarchs, though: several government ministers would traditionally receive and carry the boxes for sensitive papers and important information. According to the Daily Mail, however, an initiative began in 2015 to replace the red boxes and hard copies of papers with digital copies and smartphones. The Queen, however, still receives her daily red box, having one delivered every single day except for her two official days off: Christmas Day and Easter Sunday. These boxes contain important documents from her Cabinet and from the Foreign and Commonwealth Office for the queen to review in her role as head of state. While some of the documents contained in the boxes require her immediate attention or even her formal signature to move forward, others are simply information so that the monarch can stay aware of the proceedings in the government or be well briefed prior to important meetings. The details on who, specifically, prepares the Queen's red boxes are not quite as clear to the members of the public. Her private office, as well as representatives from government departments, handle the documents' selection, arrangement, and delivery to the queen's desk. On the semi-fictional series The Crown, for instance, King George VI instructs a young Elizabeth that she should open the box, flip it upside down, and then work from the bottom up, claiming that the boxes' preparers "hide" the information they don't want the monarch to see by burying it at the bottom. While it's a witty story, no one knows if the anecdote is actually true - although Queen Elizabeth did, certainly, learn a lot about the daily life of being a monarch by shadowing her father. Red boxes, in their current iteration, have only been around 150 years old. However, the tradition of sending a "despatch box" of some kind actually dates back to Queen Elizabeth I, according to the box manufacturers Barrow, Hepburn & Gale. The company also features some history on the reason for the red color of the box, offering two plausible explanations (confirmation of the true history of the color has been lost to history). "There are two possible reasons why the Despatch Box became the iconic red color. The widely-accepted reason relates to Prince Albert, Consort to Queen Victoria, who is said to have preferred the color as it was used prominently in the arms of his family, the Saxe-Coburg-Gotha. However, there is a School of thought with origins dating back to the late 16th century, when Queen Elizabeth I's representative Francis Throckmorton presented the Spanish Ambassador, Bernardino de Mendoza, with a specially constructed red briefcase filled with black puddings. It was seen as an official communication from The Queen, and so the color red became the official color of the state." Regardless of how the boxes came to be, they've become one of the most visible symbols of the monarchy and of the relationship between the monarch and the government.